Todd Allison is a former Platoon Leader and Company Commander in the U.S. Army. Prior to joining Kellogg’s M.B.A. program, he was an Engagement Manager at Oliver Wyman. In 2007, I served as a platoon leader in a US Army unit deployed to Iraq for a 15 month tour. 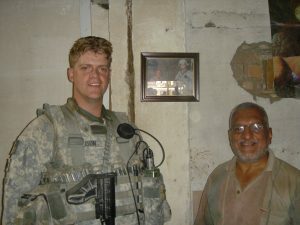 My unit was posted in northeastern Baghdad near Sadr City, a regular flashpoint during the war. I was reasonably well respected in my battalion (~1,000 soldiers) and my company (~120 soldiers), and I was well connected to a network of other junior officers and operational staff officers. However, while pushing a strategic change in our economic and community building efforts, I learned a tough lesson about trust. At that time, the typical Army approach to economic and community development was to focus on larger projects, such as street clean up, park revitalization, or community center construction. This work was usually conducted by a local contractor on behalf of the Army with structured, cash payment contracts. These contracts were intended to deliver three benefits: improve the infrastructure, create jobs, and develop community relationships. However, the community leaders would often take a cut of the money and hire more skilled workers from outside the area, eliminating any job creation benefit in the targeted area. Further, the projects were often directly tied to US forces, leading to a lack of utilization after their completion. Worst of all, the relationship with community leaders quickly became transactional and easily fractured. All of these factors contributed to the lack of trust the average community member had in the Army’s intentions and execution of projects. On paper, these projects were perceived as tangible signs of progress, however, and as a result, commanders were pressed to use their budget allocations to develop more of these projects, increasing the number of lower-value projects getting approved. When my unit arrived in Iraq, we received a plethora of briefings on topics ranging from intelligence to coordination efforts, as well as available assets and resources. One such briefing from our Civil Affairs unit highlighted community development tools, including microgrants. These microgrants could be used to develop key relationships with local businesses, farmers, and community councils. Having studied economics in undergrad, I quickly saw the potential value of these grants in boosting economic production in our area, and began working with the other officers in my unit to define a strategy that could successfully leverage this program. Our strategy focused on utilizing the microgrant process to develop the broadest set of tangible relationships in our neighborhood—Al Beidha’a—to support community development and intelligence gathering. The first step was to develop a plan that would systematically cover the neighborhood, ensuring that there was no whiff of favoritism. Second, each microgrant, usually $1,500-$2,500, was provided to directly support a loose business plan, such as buying new equipment or purchasing inventory to produce or sell more goods. This business plan concept ensured that we would need to interact with the business leaders and employees during the planning phase, and it gave us a clear rationale to stay connected well after the microgrant had been paid. All of this interaction and documentation provided a trove of information that we quickly turned into a searchable, interactive Map of our neighborhood, with photographs and individualized information about each micro-grant, such as when it was given or how many times we had visited the location. Our economic objective with each microgrant was to create a job or ask the business owner to take on an apprentice. Over the course of eight months, we were able to create around two hundred jobs or apprenticeships in businesses ranging from furniture manufacturers to metal workers to water distillers. Even corner stores hired apprentices to help clean their stores and learn the business. The results were impressive—not only in terms of improving employment and economic activity, but also in improving the security of the area. Before we implemented the microgrant program, we faced an average of five to seven attacks per month. From the start of the program in July of 2008, until we redeployed in February of 2009, there were only two attacks—an IED on a road near a market and a single RPG fired at our combat outpost. Both of these attacks were reported ahead of time by local individuals, who had gotten our interpreter’s phone number during the microgrant process. In the case of the IED, we were able to safely clear it with little damage to the adjacent buildings. We were also invited to join the local market councils, a loose association of business owners in the major market centers. Where we could help, we would always provide assistance, but the major success was the local coordination between our unit and the influential people in the area. This established a relationship of trust we were able to call upon during several incidents. First, trust takes time and effort. It’s not just “doing what you say you are going to do” (although that’s important), it’s sitting down with the other parties, listening to their perspectives, and then taking their perspectives to heart. And you can’t do that only once. Situations change, needs change, and challenges change, so you have to maintain an ongoing dialogue. Second, the benefits of trust often have a positive impact that extend far beyond the primary activity you are focusing on. Our main aim was to increase the number of citizens with a stake in their local economy, and trust helped us do this. But the trust we built with local community members and business owners spilled over into other domains like local governance and security. Our insight was to find the tangential interests of our key stakeholders that resulted from our initial successes. This focus allowed us to maintain our momentum past our initial success with microgrants. The final – and toughest – lesson about trust came when we pushed for other other units to deploy these tactics. Once we realized that we were onto something, I wrote a lengthy report detailing the ‘why and how’ of the microgrant program and began to champion it wherever I could. However, our company was located on a small combat outpost in the middle of our neighborhood and we rarely, if ever, traveled to the larger bases that housed our higher headquarters. So unless something serious was happening, or I was summoned by our chain of command, I rarely saw my peers in other units while deployed. Given the limited channels of communication, I asked my company commander if he could speak with the battalion commander. My well-intentioned, but admittedly self-serving goal at the time was to secure a larger portion of planned operational time (patrols) for us to use in expanding the program faster. I thought that once the battalion commander saw the program he would quickly support it. I could not have been more wrong. First, the battalion commander was skeptical about our success and hesitant to allocate time to something that did not support his current performance metrics. Further, he was unsure that we were forging relationships that were necessary or useful in comparison to the relationships that were necessary for traditional large scale projects. 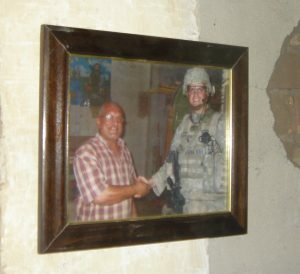 When pressed to explain the impact of our relationships, I provided a picture of a framed photo of myself and an Iraqi furniture manufacturer, shaking hands hanging in his shop where customers and employees could see it. 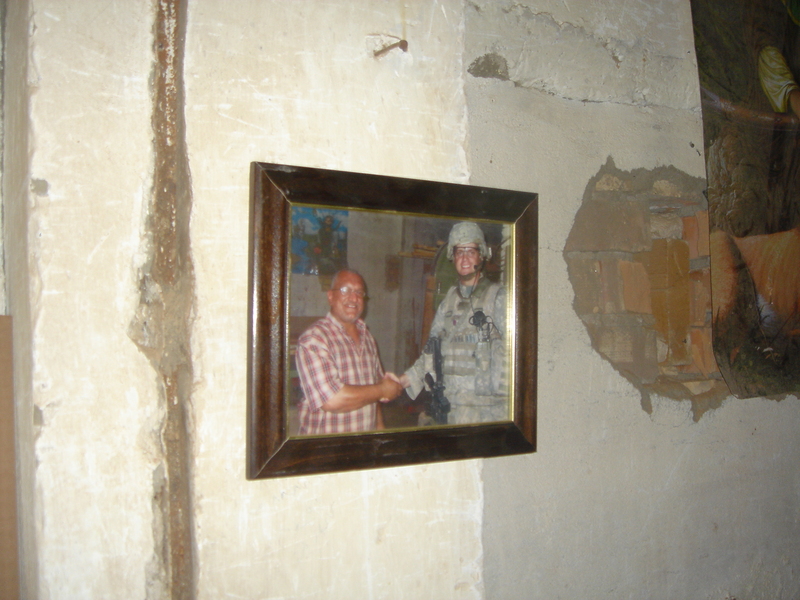 He expressed disbelief that the shop owner would risk publicly associating himself with American forces, and asked for additional proof…so I went back with another officer and took a second picture, this time of the first picture, for my next report. Finally, he decided to come visit this market to see it for himself. After meeting the businessman and other shop owners in the market, he warmed to the idea, but unfortunately, he didn’t fully appreciate the time and resources necessary to implement the overarching strategy. He tasked the other companies to start providing microgrants but, because he had not internalized the strategy, those companies did not understand either what they were supposed to be doing or why they were doing it. Some units believed they were supposed to simply hand business owners a specified amount of money. Thinking that the entirety of a microgrant could be accomplished in a single meeting, they overlooked the true value of the program. I knew we had missed the mark when I saw a report about the battalion commander himself handing out microgrants. He didn’t understand that he just robbed the local platoon leader of the opportunity to form a meaningful relationship with that set of business owners, who were now unlikely to ever want to deal with a first lieutenant again after meeting personally with a lieutenant colonel. In retrospect, I realize that in trying to promote the micro-grant program more widely, I did not apply the very things I learned building those relationships of trust in Al-Beidha’a. I was trusting our operations team to take the microgrant idea and run with it—to implement it the same ways and for the same reasons as my company. But because our company leadership team was a tightly-grouped network working in a remote location, we were in many ways sealed off from the operations team. They had our ideas on paper, but they had not yet come to trust in some of the important principles of the idea—for example, the importance of local army officers building relationships with local businesspeople. We should have invested more time working with the battalion operations team on the program—and not just once or twice—in order to establish a trusting relationship and a consistent line of communication. I believe this would have created a strategic alliance, giving us access to discussions and decisions that we were not otherwise included in. When another part of your organization adopts your best practices, it’s essential to understand that those ideas will no longer be yours. They will need to be interpreted and applied in ways that are appropriate to the organization adopting the practices. The dissemination of our microgrant strategy, however, would have been far more effective if we had established a trusting and ongoing relationship with the operations team in advance of their tasking the program to other units. For example, we could have worked together to codify the most important tactics of the program and establish common agreement about which tactics are ‘nice to have’ and which ones are necessary. Why did I not take the time to establish a trusting relationship about the microgrant program with the operations team? Like most organizational leaders, my time and attention was stretched, I was handling a number of urgent issues, and I didn’t have the time to even think about the relevant trust issues, let alone make a commitment to develop trust with the relevant stakeholders. At the same time, I felt that my report had clearly communicated the benefits of the program in a way that should have made them easy to implement. This leads to the third lesson I learned about trust: It is easy to forget the trust lessons. In today’s fast-paced world, where organizational leaders are being asked to do more with fewer resources, it is hard not to resist cutting corners on trust. Because trust takes time to build, a busy leader may feel that it is a luxury rather than a necessity, yet, one of the most important trust lessons I learned is that no matter how good an idea may be, trust among those who are implementing the idea is an essential ingredient for success. It’s not a ‘nice to have’ – it’s required. Special thank you to Clint Rusch and MAJ Todd Looney for assisting with the article. Read more about the program at The Washington Times. Outstanding article! I am forwarding it now to my friend, a Marine Captain in Puerto Rico, who also works hard to build trust with a community who is suspicious of the U.S. Military. His new friendships have created more training opportunities for his Marines and strengthened ties between Puerto Ricans and the service members on the island. Fantastic job! Showing vulnerability assists in building trust. I trust your article because you’ve shared how you made assumptions that I, too, have made. You’ve shown that trust is an ongoing process, not a one shot event. That trust needs to extend in every direction. And it’s worth the work. Great Article! Thanks for sharing your experience and for serving in the military. It’s greatly appreciated.